And with this same intent he added here that Og was of the Refaim, whose strength and great height was well known in their days, such that they would frighten all who saw them. And he added here as well the matter of his bedstead, which was well-known in their days, and which was kept in Rabbat Benei Amon, for (just as Mendelssohn said) the Amonim kept his bed as a remembrance of their [own] might, when they were victorious over him and took his land. All this was to strengthen the image of the salvation which Hashem granted to Israel. And there is not here any this which cannot rightly be said that Moshe wrote it. And behold, it is logical that, also in Ashterot, Og had a bedstead of iron, but Moshe did not command to keep it, for it was not his way to place a hand[hold?] within his nation for the kings of the nations, who were idol worshipers, for his Torah still required strengthening, since it was new. However, King David believed that the Torah's roots had already taken root in Israel and required no further strengthening. Therefore, when he took Rabbat Benei Ammon, he did not hold back from taking the crown of their king [מלכם] from upon his head so that it would be upon the head of David [II Shmuel 12:30]. And if the bedstead of Og was still there, it seems to me that he would have undoubtedly brought it to Yerushalayim. And this that this fact isn't mentioned in sefer Shmuel, one can understand that in the span of 400 years, it was already broken and / or lost and was no longer there. And [so] it is not possible that this pasuk [in Devarim about Og's bedstead] was added in the days of David, as is the position of those who hold themselves clever. And I would ask them: who added it, and from where was it added? Behold, even if you just seek to say that what was added was כִּי רַק-עוֹג מֶלֶךְ הַבָּשָׁן, נִשְׁאַר מִיֶּתֶר הָרְפָאִים -- 'For only Og king of Bashan remained of the remnant of the Rephaim', since the remembrance of the Refaim was already forgotten in the days of David, then that Og remained from the remnants of the Refaim was something that was quite old in his [David's] generation, and it is far-fetched that it would arise in someone's mind to add this matter in a sefer, which wouldn't aid or benefit. Besides this, David and his friends, it would have been better for them to erase these words from sefer Yehoshua [12:4 -- וּגְבוּל, עוֹג מֶלֶךְ הַבָּשָׁן, מִיֶּתֶר, הָרְפָאִים and 13:12 -- הוּא נִשְׁאַר מִיֶּתֶר הָרְפָאִים] and not to add them in the Torah. For behold, David and his servants smote the children of Rafah [II Shmuel 21:22, I Divrei Hayamim 20:4]. And would it not be for greater honor to David and his servants were it said that they were the ones who slew the remnants of the Refaim. And for what cause would the people of that generation relate to a later generation that only Og remained from the remnants of the Refaim, in such manner that the children of the Rafa could not be from this trunk famed for its might and great height? Now if it is granted that the words כִּי רַק-עוֹג מֶלֶךְ הַבָּשָׁן, נִשְׁאַר מִיֶּתֶר הָרְפָאִים are not added, but were rather written by whoever wrote the sefer, behold I will ask: is it possible that this was the language of the author [with the words above included as those of the initial author but with other words allegedly by an editor missing]? Then what connection and what relation is there to the middle pasuk  with what precedes and with what follows?" I have some thoughts on this, but will keep them for (hopefully) a follow-up post. כא וְאֶת-יְהוֹשׁוּעַ צִוֵּיתִי, בָּעֵת הַהִוא לֵאמֹר: עֵינֶיךָ הָרֹאֹת, אֵת כָּל-אֲשֶׁר עָשָׂה ה אֱלֹהֵיכֶם לִשְׁנֵי הַמְּלָכִים הָאֵלֶּה--כֵּן-יַעֲשֶׂה יְהוָה לְכָל-הַמַּמְלָכוֹת, אֲשֶׁר אַתָּה עֹבֵר שָׁמָּה. 21 And I commanded Joshua at that time, saying: 'Thine eyes have seen all that the LORD your God hath done unto these two kings; so shall the LORD do unto all the kingdoms whither thou goest over. I don't know that this charging of Yehoshua regarding Sichon and Og is best inserted here of all places. There might well be better guesses. But I suspect the decision to insert it here is the link (gezeira shava) formed by וְאֶת-יְהוֹשׁוּעַ צִוֵּיתִי in Devarim 3 and ויצוהו in Bemidbar 27:23. Someone at my table in shul expressed dissatisfaction with this Rashi. How would klal Yisrael know Greek? or that Moshe was specifically choosing a Greek word here, rather than the Hebrew word morim [to mean, say, סרבנים, rebellious ones, as Rashi says earlier]? Was there even a Greek language at that time? I suggested that there may well have been a Greek language (yaft Elokim leyefet) or some precursor thereof, and that perhaps Rashi (or whatever midrash he is channeling) was doing comparative linguistics, and explaining the meaning of a Biblical Hebrew word on the basis of its Greek cognate. And that the Hebrew term got its meaning from the Greek, as a loan word, or vice versa. "fools who instruct their mentors"
"[exemplified by Greek culture and influence]. Each subsequent generation improves and adds to the advances of the previous generation, and it is likely that students can attain greater heights than their mentors."
? The Greeks themselves considered such a student who would presume to instruct his mentor to be a fool! I think the answer here was a hasty translation in this parsha sheet, and one with which Rav Trunk would not have agreed. 1) סרבנים -- rebellious ones. Compare morim with mordim. 2) Greek cognate - morim, meaning fools. 3) A Hebrew play on words, morim, those who presume to teach those who are their teachers. So there is a period or comma between לשון יוני שוטים and מורים את מוריהם. And so the Greeks themselves would not regard such a person who taught his teachers to be a fool. And Rav Trunk was connecting items (2) and (3). This is my guess and reconstruction of what Rav Trunk meant, but then I didn't hear the dvar Torah firsthand. At any rate, we can look at Greek dictionaries and figure out what the likely Greek word was. We can determine whether it just meant "fools" or "fools who instruct their mentors". And we quickly arrive at the Greek word μωρός. That is, moros, foolish, or μωρὸν, moron, foolishness, or Μωρέ, more, fool, or μωροὶ, moroi, fools. The word just means "fools", not "fools who instruct their mentors". Note that this Greek word is the root of the English word "moron". 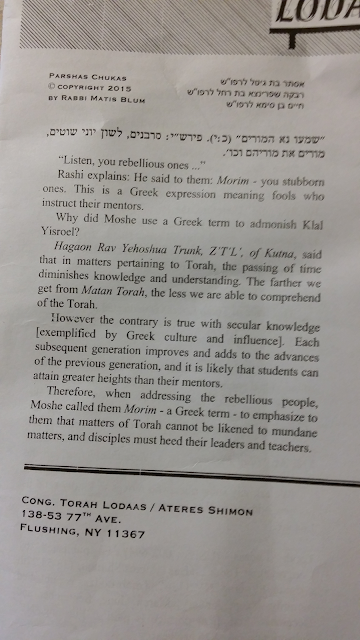 Which means that Rashi is actually rendering this phrase uttered by Moshe as "Listen up, morons!" The above might be unfair to Rav Blum. After all, Rav Trunk was interpreting the Greekness of the expression plus the message of 'those who instruct their mentors' specifically as of Greek origin, so this might just be an inconsistency in the dvar Torah itself.